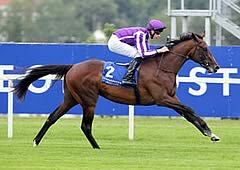 Camelot, trained by Aidan O'Brien and ridden by his son Joseph, won the Investec Derby at Epsom in terrific style. The young jockey, completing a big-race double after the Coronation Cup victory of St Nicholas Abbey, sat in rear as his stable companion Astrology took them along. He delivered a telling challenge in the straight and though it took a while for Camelot to hit the front, once he did the race was over and he stretched clear to win with complete authority. The David Lanigan-trained Main Sequence narrowly denied O'Brien a one-two, getting up on the line to edge out Astrology for second. It was a third win in the Epsom Classic for the Ballydoyle trainer and his first since High Chaparral took Flat racing's greatest prize a decade ago, and he has now saddled the winner of all four Classics run in Britain this season. O'Brien junior said: "I was a bit worried as he didn't come down the hill at all. He didn't handle the track that well, so he did well to win. He's a very special horse and I'm just very fortunate to be on his back. I owe a big thanks to the owners and everyone in the yard." Anne-Marie O'Brien, wife of the trainer and Joseph's mother, said: "I can't believe it, it's amazing. I met Lester Piggott last weekend and he said to tell Joseph not to be in any hurry (in the race). I'm really thrilled, it's incredible." The winning trainer added: "You can't even dream of days like this. I was always happy, I know his (Joseph's) body language by now and he looked confident. No-one can describe the feeling, things like this don't happen." Camelot could now bid to become the first horse since Nijinsky in 1970 to land the Triple Crown with victory in the Ladbrokes St Leger at Doncaster in September, and O'Brien went on: "We'll give it a lot of thought and the boys will make a decision. The Triple Crown would be incredible." Part-owner Derrick Smith said: "This is the one everyone wants in racing. To win the Epsom Derby is a dream come true. What a horse, what a ride. You could see from the three pole it was all over. It (the Triple Crown) must be (on the agenda), mustn't it?" Coolmore supremo John Magnier added: "We are fortunate to have anything to do with him, and it's particularly important in the year his father (Montjeu) died. We are going to have to take it race by race and give it lots of thought. "Wouldn't anybody (be tempted by the Triple Crown)? These things get to mean more as you get older. If you had asked me 30 years ago I might have looked the other way, but we will have to see what Derrick (Smith) and Michael (Tabor) say about it." Main Sequence, who had won his four previous starts including the Lingfield Derby Trial, ran a brilliant race in defeat behind Camelot to finish second in the Investec Derby, a short-head in front of the winner’s stablemate Astrology. David Lanigan, who was saddling his first Investec Derby runner, said: “I am very happy with Main Sequence - he ran a great race. 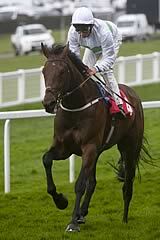 He was our first Investec Derby runner, so it’s great that he has run so well. “He got a bit edgy prior to the race, but it is a very long build-up here and once he was at the start he was fine. He did everything right in the race and was second to a very good horse. Thought Worthy tracked the pace under William Buick, but could never land a telling blow and finished fourth. 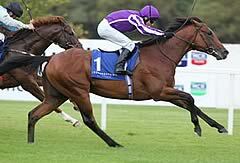 Trainer John Gosden said: “I am delighted with Thought Worthy and I was very impressed with the winner. “I thought Main Sequence would finish second prior to the race because he is a very nice horse. I thought when he won at Lingfield he showed a kick, that he also showed today, and Astrology was impressive in his trial.